Should I warm up my muscles before doing yoga? I’d like to increase my flexibility because my muscles & tendons (hips, quads, hamstrings) are tight & getting tighter because I enjoy hula hooping frequently. I think that yoga could help. 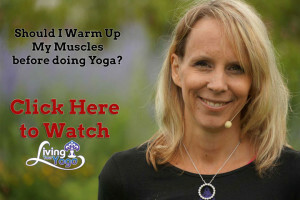 However I’ve heard about static stretching and dynamic stretching – should I warm up my muscles first before doing yoga? What is the best way to increase flexibility along with exercise? So these are great questions and I think it is going to be important to flesh them out a bit. First of all let’s talk about the difference between static and dynamic stretching. Dynamic stretching is where you are moving in a stretch. With dynamic stretching momentum and active muscular effort are used to stretch your muscles and the end position is not held. Dynamic stretching is often used at the beginning of a workout to warm-up your muscles. Static stretching is used to stretch your muscles while your body is as rest. It used to gradually lengthen your muscles to an elongated position where you hold the stretch for a length of time from say 30 seconds to 2 minutes. A lot of yoga is static stretching. Static stretching is most beneficial at the end of your workout. So for your hula hooping it would be best to warm up using dynamic stretching and then use static stretching after your hula hooping. As far as yoga, it depends on the type of yoga you are doing. I teach hatha yoga. The way I was trained I don’t “warm up” the muscles in the traditional sense of raising their heat like you would in a fitness class, but I prepare the body with gentle stretches and smaller versions of the larger poses that are to come. If we are going to be doing backbends for example I will prepare the body by releasing the spine with twists and side bends, open up the fronts of the hips, release the shoulders and maybe even the wrists depending on the final position. I can’t speak to other forms of yoga, because I teach hatha yoga, but I’m assuming it is different for different forms of yoga and that “warming up” may be required in other forms of yoga. So for example if you were going to be doing a lot of sun salutations dynamic stretching makes sense. 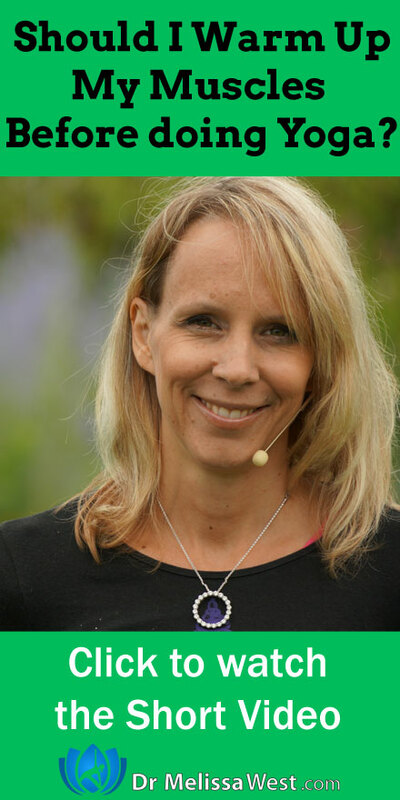 Previous post: What is a kriya?